Zhosif Yakovich Kotin was a politically connected man with a huge ego who clearly felt that he was better qualified than the Red Army to determine what kind of tanks they needed. Using those two qualities together he sold them on the KV heavy tank (named for his wife’s godfather, Kliment Voroshilov). This tank proved to be a millstone in action and had the Soviet military chosen it instead of the much simpler, more effect and easier to produce T-34 could easily have lost WWII in the first year. After several severe fights over the tank, including one with the heroic Mikhail Katukov who told him to his face it was junk, Kotin listened to some of his advisors and better designers when they created the IS (Iosef Stalin) series of tanks in 1943. These were as good as the KV was bad, and were a huge asset for the Red Army in turning back the Wehrmacht after Kursk and leading the way into Berlin. Since they had named the tank for the Generalissimo, Kotin followed this formula with his next five designs. The IS-1 and IS-2 were the wartime tanks, the first with an 85mm gun and the far more numerous IS-2 with a 122mm gun. 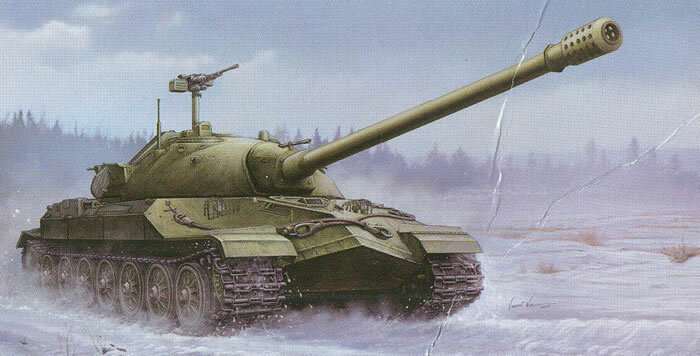 The IS-3 was a tougher and more heavily armored version of the IS-2 but given to capriciousness and poor design thus was not even functional until 1960; the IS-4 was 10 metric tons too heavy for Soviet planners and while over 200 were built spent its time in either depots or rear echelon units. The IS-5 was an improved IS-3 and followed its own development line as first the IS-5, then the IS-8, and finally acceptance for service as the T-10 in 1953. While over 1,400 of these tanks were built, by the time they entered service ATGMs and HEAT projectiles had sealed the fate of tanks with monolithic steel armor. The IS-6 was a tank that adapted some of the German ideas such as an engine driving a generator and electric motor drive, but while somewhat promising was dropped due to the huge amount of copper required for its generator and motors. The last effort was the IS-7. This tank began life as the Article 260 design in 1946, but the first two prototypes were rejected by the military for a number of reasons. The tank was redesigned and developed in 1947 with design personally overseen by Kotin. In 1947-48 five more prototypes were built and sent to Kubinka for testing. Kotin was sure this tank was “the one” as it mounted a massive 130mm gun, carried two 14.5mm heavy machine guns as auxiliary armament plus twin 7.62mm coaxial machine guns to boot. The 130mm gun fired an armor-piercing projectile at 900 mps and could easily penetrate 230mm of armor protection at 1000 meters (they were still using WWII German tanks as their standards of the day). While it used separate loading ammunition and only carried 30 rounds, it could fire at a rate of 8 rounds per minute thanks to a six-shot mechanical autoloader inside the turret, and a five man crew completed the gunnery component. Hull armor was a steeply sloped 150mm and the turret front was 210mm, thicker than anything else in 1948. It had a 1050 HP diesel engine and carried two MDSh smoke canisters for self–protection screening. Kotin figured, what’s not to like? As an example of design excess the IS-7 has always been a fascinating tank and now Trumpeter, following many other “odd duck” Soviet tanks and Cold War items, has produced a nice new kit of this unique vehicle. While it is not a cheap model, they have made it a relatively simple build thanks to minimal etched brass and a very nice set of “link-and-length” tracks. There are numerous arguments about tracks on line and in magazines, and it boils down to the fact that there are up to five choices: single runs, usually molded in vinyl; single links, usually styrene; resin, a combination of the two; metal, held together with wires or pins; and styrene link and length. My personal favorite choice is the latter; for unless you are going to articulate the wheels in a diorama most modelers show the tank sitting on flat ground and with all but a few tanks this means relatively taut tracks. Even “dead” tracks do not sag much when proper tension is placed on them per the manual. To be sure, they need some bending or flexing into place but make this part of the kit a fairly easy chore to accomplish. Trumpeter has replicated them as one-piece links where needed, so unlike most recent Trumpeter kits there are no separate guide teeth to install. Assembly is simple and straightfoward. All of the wheels are assembled first, followed by the internal bits in the hull for what Leningrad called “ejection cooling” of the engine. The hull is assembled next and the mud guards added, followed by the suspension arms (separate arm and torsion bar seat). Add the wheels, add the tracks, add the side pannier/stowage bins and done. There are no fenders per se, but these tanks used “keystone” shaped hulls with a severe cutback under the upper sides to thicken the upper side armor and few of them had more than cursory fenders. The bottom of the stowage panniers are the fenders here. The MDSh smoke canister are slick - Trumpeter has molded the body in one section using slide molding and all you add are one end and the rack. The turret is very conventional with a set of trunions for the gun barrel and an internal cross section to hold the barrel in place. The gun may be left moveable but as there is a canvas seal (parts C5/D2/D3) this would have to be ignored to use that feature. The gun barrel is stryene and in two halves, but anyone with a Flex-I-File can clean up the seams in about three minutes. The distinctive “pepper pot” muzzle brake does not come with the holes drilled out, and while tedious (there are about 60-70 of them total) it will drastically improve the appearance of the brake. (Trumpeter does tell you to do that with a 1.3mm/.050" drill bit. Two faces for the muzzle brake are provided. The KPV machine gun is the ground model, and as such has a different barrel from the more familiar cooling jacketed KVPT. The gun comes in one piece and looks to be a pretty good match, and with some accessories and bits goes on a massive tower that attaches to the turret. All hatches are optional position, but there is no interior anywhere inside the model. The light guards are cages that fit over the headlights and siren/horn and are neatly molded such that they can be trimmed off and installed with little grief. The headlights have separate lenses so anyone wishing to use after-market sets (e.g. MV Lenses) should have few problems here. Most of the etched brass covers external details (four are grilles, and five more are periscope bases) so a simple fit. As the tanks were only prototypes, the finishing directions show only 4BO camouflage green with no markings. A small sheet of decals is included with Guards badges, red starts, and 0-9 digits for a bort number. Overall this is a nice kit and for once a SIMPLE build - a rare achievement in this day and age!